Our magical and mystical show, hosted by the Angel of Redemption, opened with a selection of poetry by Thom, One of Many Angels, Invisible and Anonymous, shared poetry about experiences with angels. Our favorite artist anthropologist, Donna Dechen Birdwell, read an excerpt from her manuscript about an unbeatable soccer ritual. Then the audience hopped a freight train and took a wild ride with Tbird who rhythmically and occasionally rhymed about an encounter between a priest and a prostitute. Novelist Teresa Y. Roberson spun a humorous tale about an mysterious Honduran cockroach curse. Making her reading debut, Carmen graphically described how humans are endowed with body parts to work magic, especially genitalia to open closed doors! 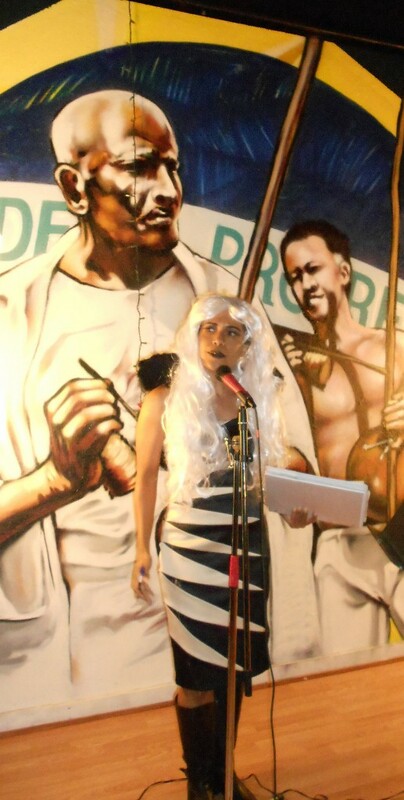 Samaria Guitaria, of Timberos del Norte, sang an enchanting and empowering song about Medusa. Making an encore appearance, Carmen ended the show with a traditional capoeira Angola song followed by Puxada de Rede, a song about a woman praying that her fisherman husband will return to after his latest fishing excursion. See you at the next roulette, Sunday, November 11th, 2012 for our “Transformation: Personal, Cultural and/or Political Change” event!